Google has built and tested autonomous aerial vehicles, which according to the company could be used for goods deliveries such as humanitarian aid to people in need and consumer deliveries. The Project Wing has been running for almost two years but was a secret until now. Google aims to help people and deliver stuff that is needed in the areas where vehicles cannot be reached. The self-flying vehicles can be used after earthquakes, floods, or extreme weather events and deliver medicines to people. The drones can transport the equipment faster than an ambulance could. The Project Wing trials have been held in Australia’s north-eastern state Queensland. Watch the video. In addition to the above, Google said it could use self-flying drones for delivering shopping items to consumers at home, just like at Amazon and Domino’s Pizza do. Google adds a new translation feature to its search results making it very easy to translate texts, edit them, change the languages and even hear the translated texts directly from the search results page. Just start typing “translate” on Google search box and it will let you quickly enter the text you need to translate and the box below. YouTube Mix for Artists/Bands on the Sidebar. Is it new? Have you noticed this before on YouTube? When you search for an artist/group/band along with usual results, on the right sidebar YouTube returns ‘YouTube Mix‘ for the artist with a larger cover photos. Below the ‘YouTube Mix’ there are ‘Top songs‘ and ‘Albums‘ tabs displaying their songs and albums. Below there’s also ‘Related artists‘ box showing 3 artists with album covers. Click to see the larger photo or follow the link to see it yourself. Maybe it is new to me only, maybe there are other changes as well. Let me know, if you know one. BlackBerry is acquired by Fairfax Financial Holdings for only $4.7 billion..
Video on Instagram to bring you another way to share your stories. When you go to take a photo on Instagram, you’ll now see a movie camera icon. Tap it to enter video mode, where you can take up to fifteen seconds of video through the Instagram camera. BlackBerry certainly surprised us today at its BlackBerry 10 launch event. Not only did it announce its plans to drop RIM (Research in Motion) from its name – it’s now just BlackBerry – but towards the end of the presentation CEO Thorsten Heins brought Alicia Keys on stage. And not just as a performer or to endorse the new products. He announced the singer and songwriter as the new BlackBerry global creative director. LG 84LM9600 84-inch – The largest LCD released so far, and one of the first with 4K resolution. 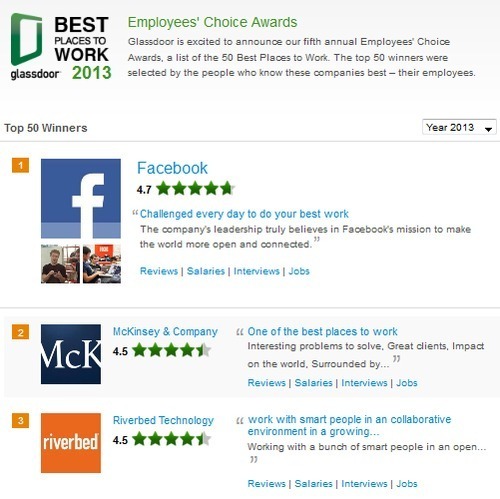 The best company to work is Facebook where the employees are ‘very satisfied’ and 94% of employees recommend this company to a friend. I decided to break down the list of the TOP 100 BRANDS 2012 by the countries. Recently, Apple revealed the latest — and in its words the greatest — version of the iPhone: iPhone 5. The competition is – and has always been – huge between Samsung Galaxy and iPhone. And though Samsung lost the patent battle against Apple, but it doesn’t mean they quieted down. 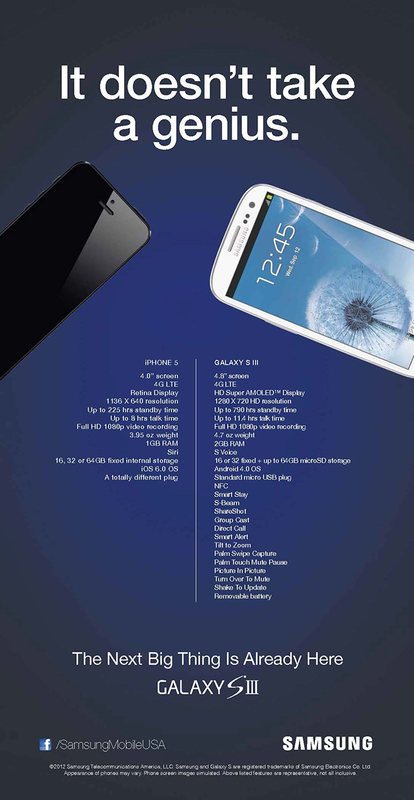 In a new ad shown to Mashable that will start running in various national and regional papers on Sunday, Samsung – the Korean electronics giant – has stacked the specs of its Galaxy S III smartphone against the newly-announced iPhone 5. The tagline of the ad: It doesn’t take a genius. Obviously, Galaxy S III has a much longer list of features than the iPhone 5, and its main advantages over the iPhone are HD resolution, RAM and Talk Time, + NFC (near-field communications) technology, which is not included in the iPhone 5. Also, pay attention to the last feature of the iPhone 5 – a totally different plug – it’s the key feature and the main advantage of the new iPhone 5. Microsoft has changed their logo. 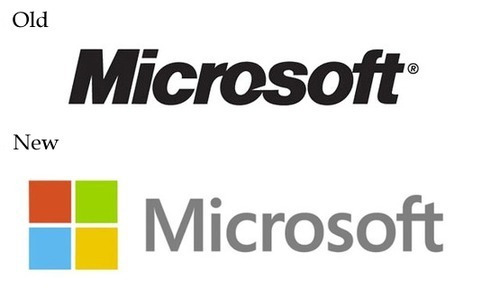 The new version of Microsoft logo uses a symbol for the first time of the company’s history. It is a square made of four smaller squares of different colors. It reminds Microsoft’s Windows logo, however, it is straight and doesn’t look like waving flag. New logo is softer-looking and more colorful. It uses Segoe font which looks softer and lighter than the previous font and is more grey than black. As in the previous version of the logotype, in the new one as well, the last two letters -f and t – are linked each other. Well, I like the new logo, what’s your opinion?